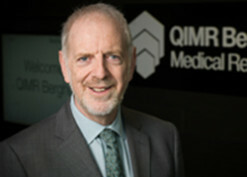 Professor Frank Gannon is the QIMR Berghofer Medical Research Institute’s seventh Director and CEO. In this role he is responsible for strategy, research work undertaken by the Institute and management of employees, under the overall control of the Council. Professor Frank Gannon joined QIMR Berghofer as Director and CEO in January 2011. Previously, he was the Director General at the Science Foundation Ireland (SFI) from 2007. From 1994-2007, Professor Gannon was the Executive Director of the European Molecular Biology Organization (EMBO) and Senior Scientist at the European Molecular Biology Laboratory (EMBL), based in Germany; and Director of the National Diagnostic Centre and Associate Professor in the Department of Microbiology at University College Galway, Ireland (1981-1994). His major research interest is the regulation of gene expression by the oestrogen receptor, which plays a major role in breast and endometrial cancer. These studies have provided leads to novel treatments or therapeutic approaches to these and other cancers. He was Vice President of the European Heads of Research Council and an advisor to the European Union Commissioner for Research and Innovation prior to his move to Brisbane. He was awarded a Doctor Honoris Causa by the Josef Attila University, Szeged, Hungary in 1999, Doctor Honoris Causa, Queens University, Belfast, Northern Ireland in 2008, and Doctor Honoris Causa, Queensland University, Brisbane, Australia in 2008. He was elected as a member of the Royal Irish Academy in 2007, a member of the European Academy of Cancer Sciences in 2009 and the Australian Academy of Health and Medical Sciences in 2014.